On August 15, 2017, staff at The Neuro gathered together to celebrate the birthdays of three distinguished figures in the history of The Neuro! 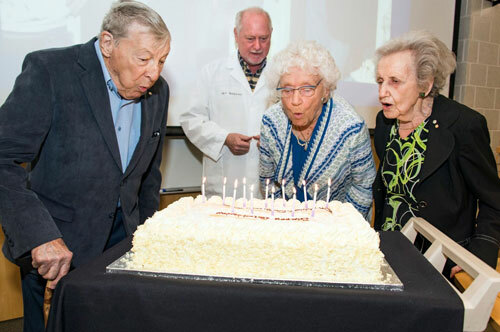 Dr. Brenda Milner turned 99 on July 15, Dr. Hanna Pappius turned 92 on July 26, and Dr. Gilles Bertrand turned 93 on August 5. The life work of these three individuals covers all aspects of neuroscience: cognitive function (Dr. Milner), surgical anatomy (Dr. Bertrand), and brain chemistry (Dr. Pappius). Watch attendees sing Happy Birthday to the trio! On September 13, staff at The Neuro participated in Neuro Staff Appreciation Day in large numbers. 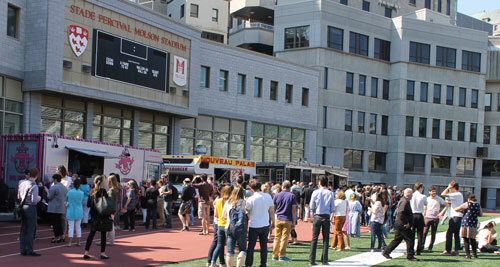 The event took place at Percival Molson Memorial Stadium on a picture-perfect day! This annual event was developed to recognize and honour the dedication, compassion, and tireless work of all personnel. Attendees enjoyed free lunch from some of Montreal’s best food trucks, fantastic raffle prizes, athletic games, and even Latin dancing! The mood was positive as people took advantage of the rare opportunity to gather together as a community… and play. See more photos on our Facebook page!